ARTHUR, N.D.—This is harvest season in the rich farmlands of the eastern Dakotas, the time of year Kevin Karel checks his computer first thing in the morning to see how many of his soybeans Chinese companies have purchased while he was sleeping. Farmers in Cass County have prospered over the last two decades by growing more soybeans than any other county in the United States, and by shipping most of those beans across the Pacific Ocean to feed Chinese pigs and chickens. But this year, the Chinese have all but stopped buying. The largest market for one of the United States’ largest exports has shut its doors. 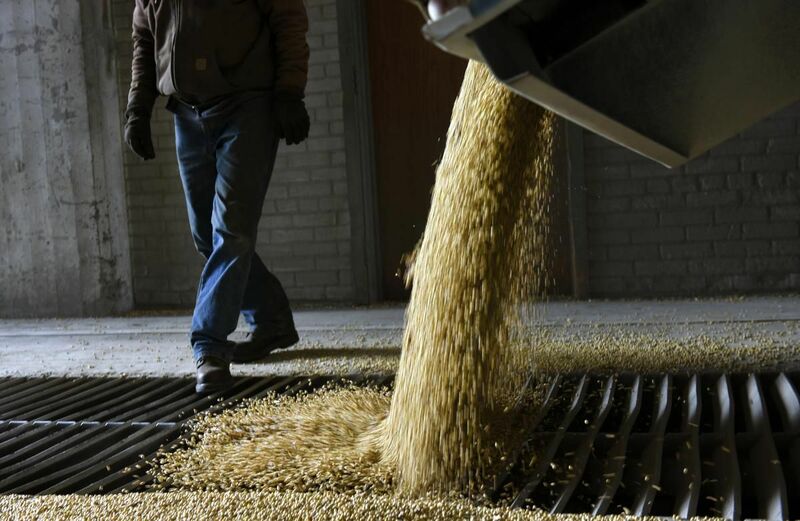 The Chinese government imposed a tariff on American soybeans in response to the Trump administration’s tariffs on Chinese goods. The latest federal data, through mid-October, shows American soybean sales to China have declined by 94 per cent from last year’s harvest. Karel, the general manager of the Arthur Companies, which operates six grain elevators in eastern North Dakota, has started to pile 1 million bushels of soybeans on a clear patch of ground behind some of his grain silos. The big mound of yellowish-white beans, already one of the taller hills in this flat part of the world, will then be covered with tarps. The hope is that prices will rise before the beans rot. “We’re sitting on the edge of our seat,” Karel said. President Donald Trump sees tariffs as a tool to force changes in the United States’ economic relationships with China and other major trading partners. His tough approach, he says, will revive American industries such as steel and auto manufacturing that have lost ground to foreign rivals. But that is coming at a steep cost for some industries, such as farming, that have thrived in the era of globalization by exporting goods to foreign markets. China and other trading partners hit with the tariffs, including the European Union, have sought to maximize the political impact of their reprisals. The European Union imposed tariffs on bourbon, produced in Kentucky, the home state of U.S. Senate Majority Leader Mitch McConnell, and on Harley-Davidson motorcycles, from Wisconsin, the home state of House Speaker Paul Ryan. China’s decision to impose tariffs on soybeans squeezes some of Trump’s staunchest supporters across the Midwestern farm belt. Like most successful American exports, soybeans are produced at high efficiency by a small number of workers using cutting-edge technologies, like tractors connected to satellites so the optimal mix of fertilizers can be spread on each square foot of farmland. The United States exported $ 26 billion (U.S.) in soybeans last year and more than half went to China. Some farmers in North Dakota say they trust Trump to negotiate in the nation’s interest. Karel said many of his customers wear red “Make America Great Again” caps and insist that the pain of lost business and lower profits is worthwhile. They say they will suffer now so their children benefit later — echoing the argument Trump has made. Others are less enthused. Greg Gebeke, who farms 5,000 acres outside Arthur with two of his brothers, said he struggled to understand the administration’s goals. North Dakota’s soybean industry was created by Chinese demand for the beans, which are crushed to make feed for animals and oil for human consumption. China is by far the world’s largest importer of soybeans. The country consumed 110 million tons of soybeans in 2017, and 87 per cent of those beans were imported — the vast majority from either Brazil or the United States. While soybeans are grown throughout the Midwest, the soybean fields of North Dakota are the part of soybean country that is closest to the Pacific Ocean, and so its beans are mostly sent to China. In the mid-1990s, there were 450,000 acres of soybeans in the state. Last year, there were 6.4 million. As the state’s production of soybeans increased, companies spent millions of dollars on larger grain elevators, on the 110-car trains that carry the soybeans west to the Pacific Coast, on bigger terminals at the ports. A few years ago, Gebeke traded his grain drill, used to plant wheat, for a second machine to plant soybeans. The Arthur Companies in 2016 opened a shiny drying, storage and loading facility that can hold 2.7 million bushels of beans waiting for the next train. Soybean farmers also spent millions of dollars cultivating the Chinese market. Farmers in North Dakota and other states contribute a fixed percentage of revenue to a federal fund called the “soybean checkoff” that pays for marketing programs like trade missions to China and research intended to convince Chinese farmers that pigs raised on American soybeans grow faster and fatter. In 2015, North Dakota soybean farmers footed the bill for an event in Shanghai honouring the 10 “most loyal” buyers of American soybeans. The soybean industry’s sales pitch emphasized the reliability of American infrastructure and the political stability of the United States. The message was that the Chinese could be confident that American farmers would deliver high quality soybeans. The last two decades were a fat season in the soybean belt. The grain silos and pickup trucks in Cass County are shiny and new. Karel said a significant number of the farmers who sell crops to his company had done so well they purchased winter homes around Phoenix. But the mood is souring quickly. Gebeke’s wife, Debra, a retired psychologist, has returned to work at North Dakota State University, to counsel distraught farmers. Public health officials in North Dakota, already confronting a recent rise in suicides, are concerned about the impact of falling prices, particularly on younger farmers with high levels of debt. As China swallows the world’s supply of non-American soybeans, other countries are buying more beans from the United States, especially European nations that usually import beans from Brazil. Some nations that grow soybeans, such as Canada, are shipping their own beans to China at high prices and then buying American beans at lower prices to meet domestic demand. Taiwan, seeking to curry favour, signed a deal to buy more American soybeans over the next two years. None of this is nearly enough. During the first six weeks of the current export year, which began in September, American soybean exports to China are down by about 6 million tons from last year, while soybean exports to the rest of the world are up by only 3 million tons. Some analysts predict China will be forced to buy more American beans after it exhausts other sources. Others are hopeful that China and the United States will reach a deal to remove the tariffs. But waiting carries risks. Soybeans can spoil and Brazil harvests its crop in the spring, creating fresh competition for American beans. “Hope is unfortunately a terrible marketing plan,” said Nancy Johnson, executive director of the North Dakota Soybean Growers Association. The industry continues to seek new markets. Jim Sutter, chief executive of the U.S. Soybean Export Council, said he was focused on persuading Indians to eat more chicken. The council, which already provides funding to Indian trade groups, is planning to back an advertising campaign. “People in India will eat more protein as the economy grows, but our job is to speed that up,” Sutter said. The Trump administration said in August that it would distribute $ 3.6 billion to soybean farmers to offset the decline in market prices. The subsidy rate of 82.5 cents per bushel, however, covers less than half of the losses facing North Dakota farmers at current market prices. Brandon Hokama, whose family farms 3,500 acres near Ellendale, North Dakota, estimates that they need a price of $ 8.75 per bushel of soybeans to break even. Last year at this time, soybeans could be sold for almost $ 10 per bushel. Now, local elevators are offering prices below $ 7. Farmers typically begin to purchase seeds and fertilizer before the end of the year, so the low prices are shaping next year’s crop. The Hokamas divided their land evenly between soybeans and corn this year; next, they plan to plant half as many acres of soybeans. Instead they will devote more land to corn, and also to some wheat for the first time in two decades, and perhaps specialty crops like peas and black beans. Hokama knows that other farmers are likely to make similar decisions and that the corn market next fall may be glutted. Specialty crops like peas and edible beans command higher prices, but also require more work and specialized equipment. Also, unlike the big cash crops, specialty crops cannot be hedged. That means the farmer carries all the risk of a bad year.